New posts when they happen. Based in central California, Thestruggleisneal is a blog by Neal Powell. His posts explore the journey of being an adult, but a kid at heart, and trying to make that work ... sometimes ... rarely? Real World Lore:The art depicts the end of Wagner's ring cycle where Siegfried is being burned in a funeral pyre and Brunhilde is riding on Grani with the titular ring to be cleansed in the fire. RPG Lore: Tales have been told of Roulette and its curse for centuries. It is said that the horse has origins that trace back to the earliest days of the world when all manner of life walked together. The time that darker things tainted the land. 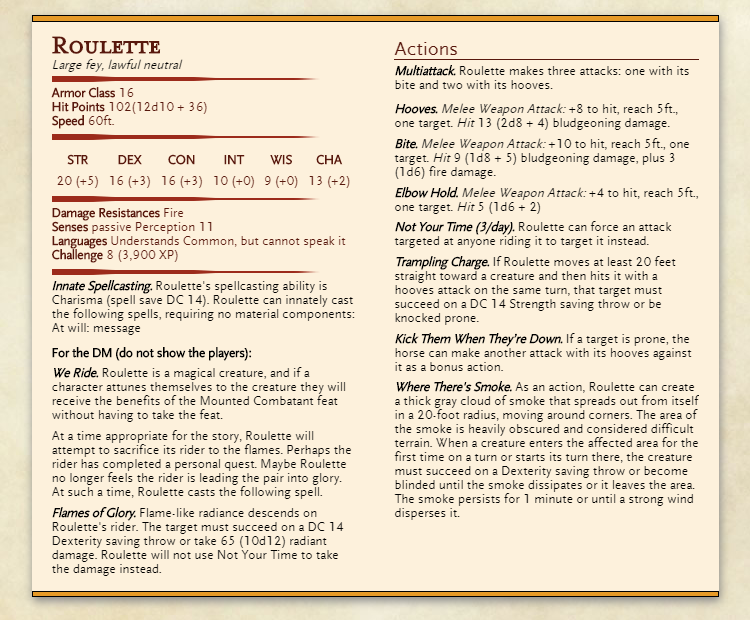 Roulette has survived all of this time as they can never truly die. The consequences of riding this steed are known, but is it worth the power the rider can wield? Lesser known is that the steed has been tainted with demonic blood, and carry with it an infernal flame. With those bits of lore out of the way it’s on to the album! Gotterdammerung Highlights - Leopold Stokowski and The London Symphony Orchestra was a bit more of a stretch than some of the other albums that have come before it! The cover image is one of the only notably inspirational pieces, but there is still a ton to work with. With that we give you the cursed mount named Roulette! Shout Out: This week’s shout out goes to the awesome person who took me up on my Twitter shout out, Ed Chuck. Check him out on Twitter @dreamingoflight or head over to MadBirdStreams every Friday at 10pm ET to check out the awesome Stormfall D&D stream there! Seriously, Ed was awesome to work with and I can’t wait to see all the awesome things they do! Based in central California, Thestruggleisneal is a blog by Neal Powell. He is on the journey of being an adult, but a kid at heart, and trying to make that work ... sometimes ... rarely?